How do you get city kids interested in agriculture? It’s one of the first questions I was asked when I joined DAI, and as a confirmed urbanite, I must admit it’s not a discussion I expected to have. The topic came up in a meeting with my colleagues in DAI’s Energy & Resources Group, who have been working over the last year with the Kosmos Innovation Center (KIC) in Accra, Ghana. The KIC, the flagship corporate social investment effort by Kosmos Energy, is exploring creative ways to address development challenges in Ghana, and in its first year, it has set its sights on boosting Ghana’s agricultural sector. 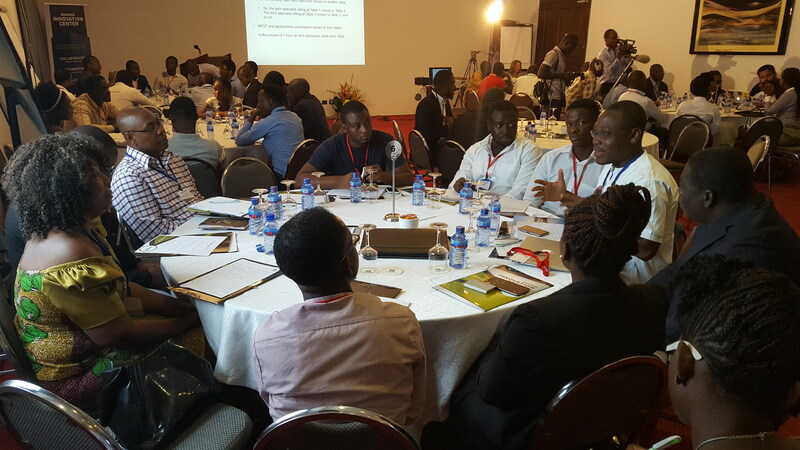 One of the assumptions behind KIC’s efforts is that getting young entrepreneurs to invest in Ghana’s agricultural sector will inject some much-needed energy into a field on the decline. So KIC has been working with the Meltwater School of Entrepreneurial Technology (MEST), a school and incubator for African startups. As you might expect, MEST students are largely young, city-educated students who have never set foot on a farm in their lives. So, back to the question at hand: how do you get city kids interested in agriculture? More accurately, how do we get MEST incubatees to think of the agriculture sector not just as a relic but as a sector with complex value chains that, while they may be struggling, also present a number of business opportunities? Our answer was the AgriTech Exchange—a two-day workshop hosted by Kosmos Energy on April 13 and 14 where young MEST entrepreneurs worked side by side with seasoned Ghanaian agribusiness experts and technology specialists to create ICT-driven business concepts that can address some of the sector’s most pressing challenges. The architecture of the Exchange builds on similar workshops hosted by the State Department, PeaceTech Lab, and DAI’s own Foro de Tecnologia. The premise is that simply informing the young MEST participants about ICT-based business opportunities in Ghana’s agriculture wouldn’t be enough. Instead, we constructed an interactive experience where they could get their hands dirty—metaphorically speaking—learning about what a day in the life of a Ghanaian agriculturalist looks like, and brainstorming ideas for ICTs that solve problems across the value chain while also creating the basis of viable startups. Representatives from mobile operators Vodafone and Airtel as well as technology companies like Esoko, Farmerline, and HNI also attended. The result: half a dozen creative product concepts, from a smartphone app that monitors fertilizer and seed distribution to a text and web-enabled system that provides financial analysis and investor matching for smallholder farmers. Speaking of getting their hands dirty, KIC, MEST, and DAI are now providing the MEST entrepreneurs a series of mentoring, coaching, and market research opportunities, including visiting farms and production facilities around Ghana. The goal is to help them refine the concepts generated at the Exchange into fully viable businesses—a small step, hopefully, towards restoring agriculture’s place in Ghana’s economic future.